The thing about lavender-scented household products is that they rarely seem to smell like lavender. Which isn’t to say they don’t smell nice. This definitely holds true for Mrs. Meyer’s Lavender Clean Day Room Freshener and Fabuloso Lavender Multi-Purpose Cleaner. Let’s start with the room freshener. In general, I’m not a fan of room sprays. I like a gently scented candle or an occasional baton of incense, and I burn a lot of Papiers d’Arménie near the litter box, but I like my home to feature me as its scented focal point. However, I recently spent a week in a house in Palm Springs with a spray bottle of Mrs. Meyer’s Lavender Clean Day Room Freshener on the bathroom counter. How could I not try it? When I returned home, I bought a bottle for myself. To me, Mrs. Meyer’s lavender room spray smells like iced tea with lemon and honey and a few rose petals floating on top. It’s present but unobtrusive, and it’s fresh without screaming “cleaning products.” Its label touts lavender’s ability “to be relaxing, soothing and relieve fatigue,” and its ingredients do include lavender oil — although it’s listed below castor oil and something called Trideceth-9, so I wouldn’t guess the company is decimating Grasse’s lavender fields. A warning: one spritz is plenty. The room spray has the freakish ability to expand and travel throughout the house. It’s like the schtick with the clowns in the Volkswagen bug. More than one spray, and you’ll be smelling Mrs. Meyer’s freshener in the basement. You know how when you return after a trip, you see your home like a stranger might? After spending a week in an immaculate house, I set down my suitcase inside my door and realized my place could use a good cleaning. The next day I bought a jug of Fabuloso and went to work in the kitchen. Fabuloso Lavender Multi-Purpose Cleaner is grape-punch purple. Plus, it’s called Fabuloso, which calls to mind old-timey magicians (“Gather round and watch the amazing Fabuloso cut a woman in two!”). I was suspicious. Fabuloso’s label announces it as lavender scented, but hydrangeas cover most of the label, with only a few obligatory spears of lavender. I poured the recommended quarter cup into a gallon of water and started mopping. Fabuloso has a resinous edge, like it wants you to know it’s not just soapy liquid here for pleasure, but is on a job. Diluted with water, the fragrance smooths into a tart woody floral on a foundation of pine and laundry musk. A hint of fruity violet seems to sweeten it. This doesn’t mean Fabuloso smells anything like perfume. You’ll never confuse it with Christian Dior Dune. No, Fabuloso is a cleaning product and wafts it loud and proud. 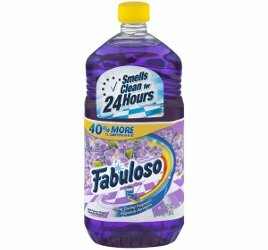 Fabuloso’s label also says it “smells clean for 24 hours.” It must have met its challenge with my kitchen floor, because by dinner its fragrance had vanished. Which was all for the best. I still do want to be the best smelling thing in my house. 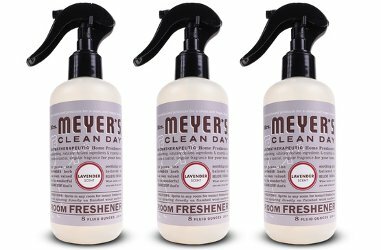 Both Mrs. Meyer’s Clean Day Room Freshener (8 oz spray) and Fabuloso Multi-Purpose Cleaner (56 oz) are cheap thrills at less than five bucks each. Agree, Meyer’s Lavender doesn’t smell like lavender, but maybe if I changed my expectations I would like it more. Though I can’t use a lot of even eco-friendlier products because one of my cats is sensitive and gets very itchy shortly after cleaning 🙁 The one product he does fine with happens to smell very much like lavender EO (J.R. Watkins lavender surface cleaner). I suspect he tolerates it because there’s not much in it besides water and some alcohol, lol. I should make it myself! I hope you enjoyed your trip- we used to go to PS a lot when I was a kid. I usually don’t use any readymade cleaning products except for soap–I tend to cobble together mixtures from vinegar and baking soda or things like that. So using these products was new! Palm Springs was wonderful. The sun was clear, my hosts and other guests were terrific, and I got a lot done. Couldn’t have been better. My dogs got horribly sick after I used Fabuloso to clean the floors. We stick to all natural products now. Is the lemon verbena better? I saw that one at Safeway, too. I like them all better! From lilac to the seasonal orange clove. . . like them for washing dishes at least. I’ve never tried the room sprays–that would probably take a higher level of love and discernment than my dish cleaning products. If you aren’t allergic Amazon, good deals and a wide selection can be found on the site. Thanks! I’ll have to see what other flavors are available. I have a feeling it will take me a while to use up the bottle I have, though. I was so disappointed in the Mrs. Meyers lavender cleaner. Yes, it doesn’t smell like lavender and it’s also super strong. I’d love to have a cleaner that smells like real lavender, and I suppose I could make my own but I’m too lazy for that (or too busy). Having tried a number of Mrs. Meyer’s scents, I can say that the only one that I actually enjoy is the lemon verbena. I have the large bottle of concentrate of that one and keep refilling a spray bottle, so that really brings the price down. So I recommend that one to you all. Thank you for weighing in! I have to confess that the lavender Mrs. Meyer’s is all I’ve tried. (I guess this isn’t strictly true, since a ka-jillion years ago I had a rose geranium -?- window cleaner, which was nice.) Now I definitely want to try the lemon verbena. P.S. After years of being so over lavender (it was ubiquitous in Berkeley, CA), I’m suddenly obsessed with it. After trying a bunch of different lavender fragrances, I ended up falling in love–much to my surprise–with Killian A Taste of Heaven. I’m wearing it and wearing it and wearing it (especially in bed). One I haven’t tried! My heart stills beats faster for Moment Supreme, though. I haven’t tried vintage Moment Supreme, yet, but I really, really want to. It’s not all that expensive on eBay, but I’m resisting a blind buy. You’re smart to resist the blind buy. If I had more than 3 ml left, I’d happily send you some! Thank you, Angela. I appreciate the thought. If I ever get a bottle, I will let you know.